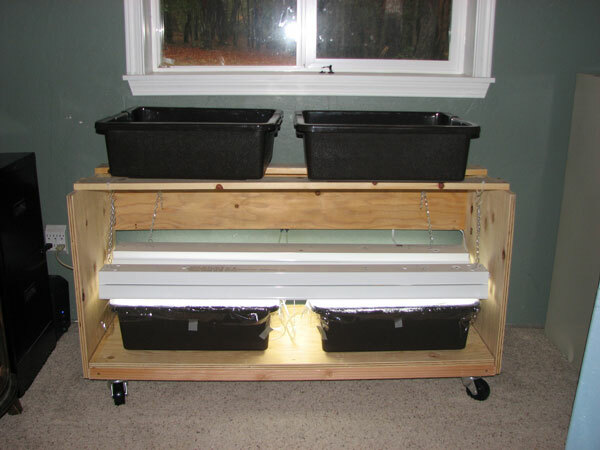 I’m always looking for 22″ to 24″ long containers that I can put under 4 foot long grow bulbs. After discovering bus boxes from the restaurant industry I think I’ve found the best possible solution. They are food grade plastic and nice and deep. They’re thick and sturdy and very available online. 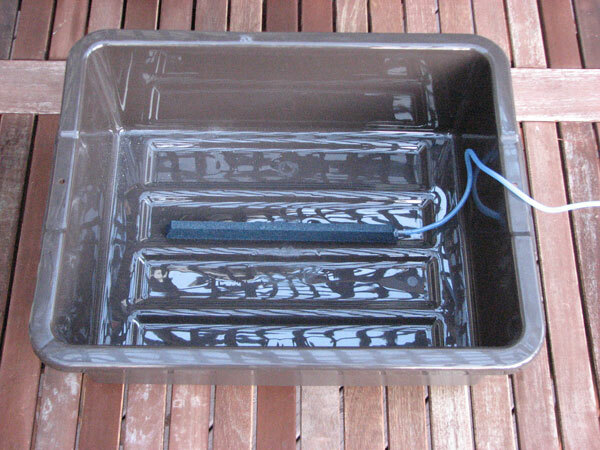 The only difficulty is coming up with a system to keep the water in the bus box, and not rot the roots of your plants. An aquarium air pump seems to work fine for me. I’ll show you how I do it. 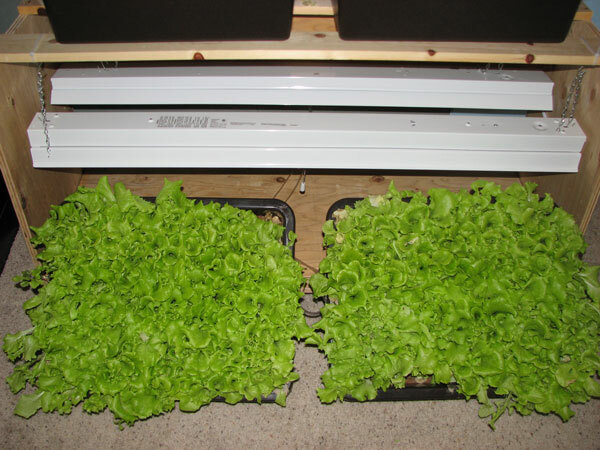 This is butter crunch lettuce grown in restaurant bus boxes. I wanted a water tight system that would no leak on the carpet, so I didn’t want to drill any holes in the bottom of the bus boxes. Unfortunately plant roots don’t like sitting in standing water all the time and this will cause them to rot. By pumping air to the bottom of the bus box you prevent root rot and encourage vigorous growth at the same time. You can find bus boxes online at restaurant supply stores. I like the ones made by Rubbermaid, but they cost a little bit more than some cheaper brands. The Rubbermaid bus boxes are very sturdy. In addition you’ll need an aquarium air pump and a large aquarium air stone, as well as some 1/4″ hose to connect the two. Silicone air hose is much more flexible than that cheap, clear PVC stuff. 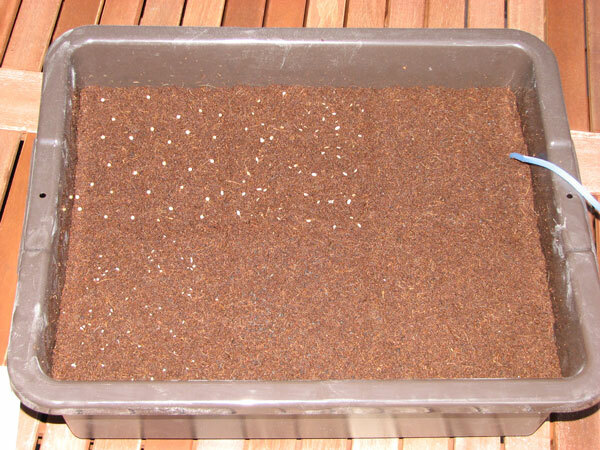 You need two kinds of growing media: perlite and coco coir. 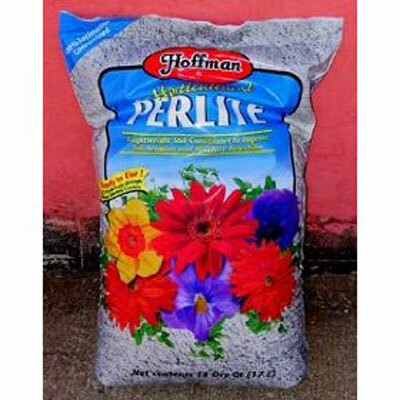 Perlite is white, feather light, and easy to find. 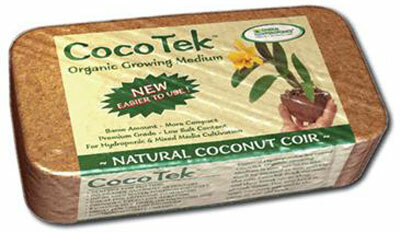 Coco coir is sold as a solid, compressed brick. 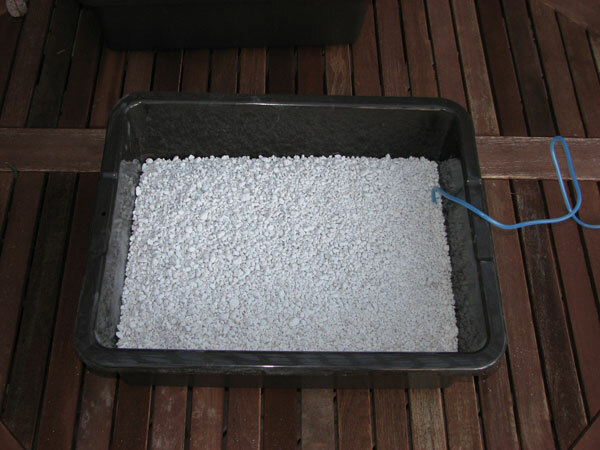 Put the perlite in the bus box on top of the air stone. 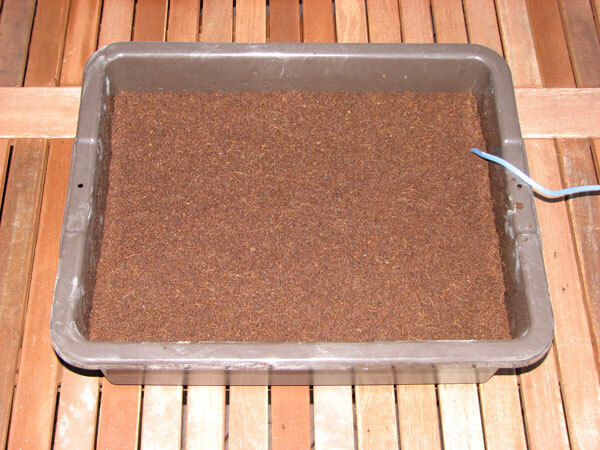 Then top it off with the rehydrated coco coir. 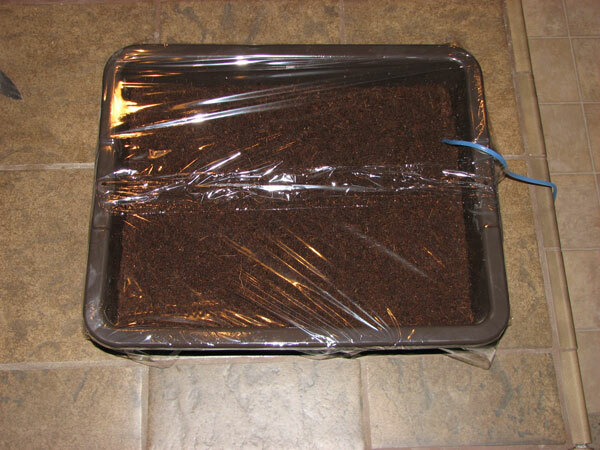 Reserve about 1/2″ layer of coco coir for covering your seeds. Seed heavily. In the shot below I’ve divided the bus box up into 6 different regions and planted 6 different herbs. Or you can cover the entire surface with just one type of herb. To help retain moisture during germination cover your bus boxes with clear plastic wrap. 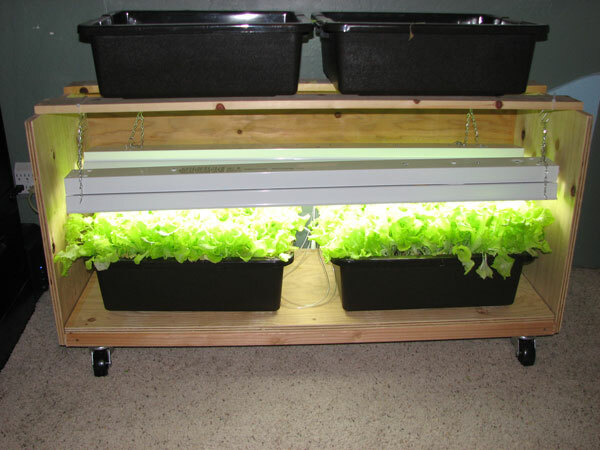 Now put your bus boxes under your grow lights. You won’t need to run the air pump for a couple of weeks, but it doesn’t hurt to plug it in now. Turn the lights on with a timer, 16 hours on, 8 hours off, and ignore your setup for about a week. After a week remove the clear plastic and start watering regularly. 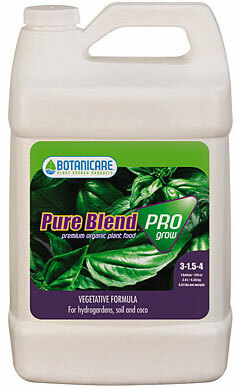 Plan on watering about 1 quart every 5 days for a month, then 2 quarts every 3 days. Make sure that you leave the air stone on 24 hours / day in case you over water. If you do over water it doesn’t hurt the plants because the air stone keeps the water from getting stagnant. After about 1 month lettuce should look like this. You should be able to harvest 1 large salad per day per bus box. Just pick a couple of leaves from each plant. 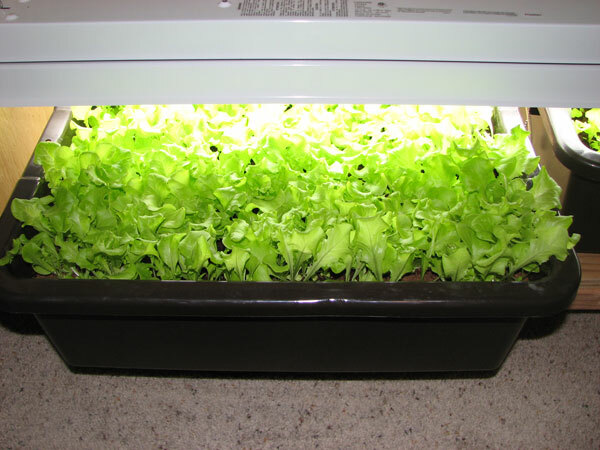 As your plants grow raise the grow lights to keep them about 2″ above the tops of the leaves. Any closer and the leaves will burn, any further away and you are wasting light. After about 2 months lettuce looks like this. This is a super simple and pretty well guaranteed way to get a good crop. It’s difficult to over water a setup like this, and just about impossible to make a mess on the floor since there are no holes drilled in any of the bus boxes. I have had exceptional quality with this setup, but not quite as good as in dutch buckets. However it’s so simple in comparison to dutch buckets, and incredibly cheap. All in all this is one of my favorite grow methods.